The sole of Grishko® pointe shoes identifies the size – from ½ to 9. How to identify your size? 3. Round-up the result to the integral multiple to five and relate the received figure to the value in the table – that will be your size. Fitting is the important part of choosing pointe shoes. To ensure that the shoe fits the foot perfectly you should use some of the methods below. Make a plie – if the ankle-joint muscle is too strained, it means that the pointe shoes are small. During making plie you will feel the shoes toe part by your longest toe, the shoe should not press the toe. Stand en pointe and make sure the heel part of the shoe fits your foot snugly. In properly fitted pointe shoes, the rear part should not seem loose and take down easily. While standing en pointe turn the rear part of the shoe inside out and make sure that the insole does not extend beyond the your heel contour (line), but is located just behind your heel. There is one more method for checking whether you have chosen the right pointe shoes. Look at your old pointe shoes and check that the platform is worn equally . The pointe shoe insole shank plays an important role of foot support. The key factor for selection here is the foot strength. The insole will support the foot, but not affect during working. The pointe shoes are chosen individually, depending on the comfort level, but the insole shall be neither too hard, nor too soft. The choreographers recommend beginners to choose pointe shoes with medium shank hardness, which provides a proper muscle workout and supports the child’s incompletely formed foot. Dancing in such pointe shoes, girls will be able to develop their arch pretty well. The fitters recommend pointe shoes with a hard insole for strong feet. 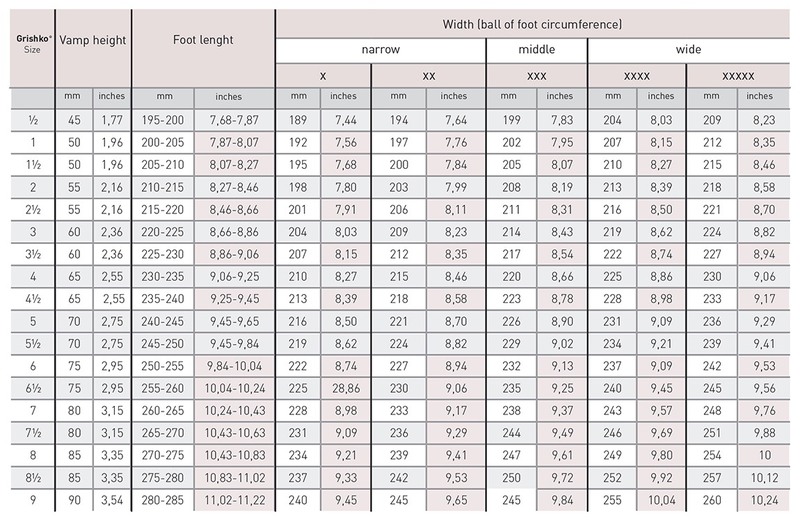 Size chart is provided as a reference and an approximate guide only and does not guarantee an exact or perfect fit. 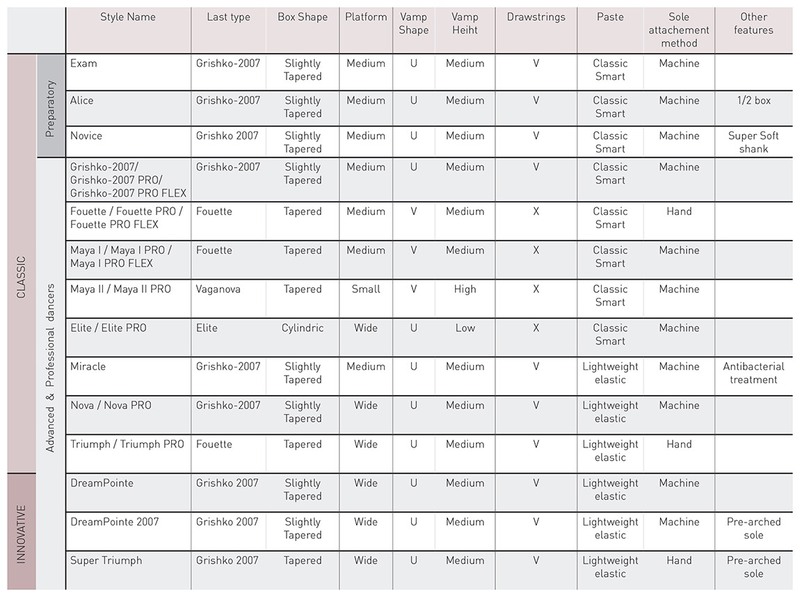 The proper fit of pointe shoes depends on individual foot shape and toe pads used by dancer. 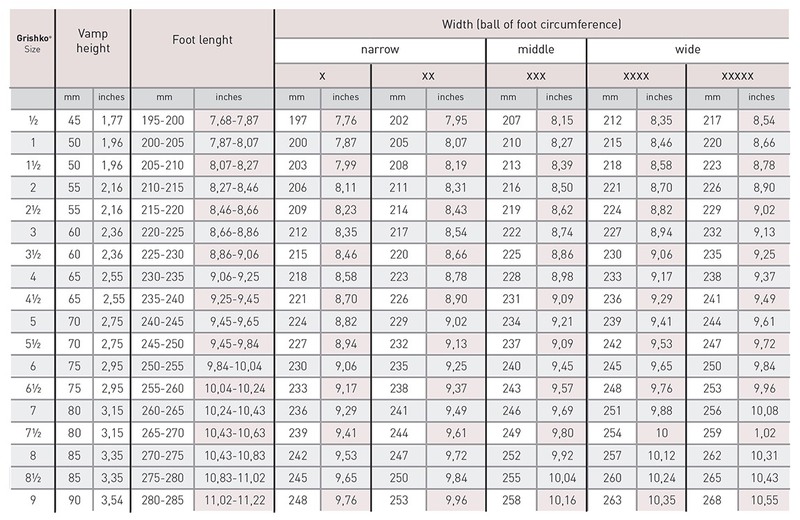 The recommended way to determine correct pointe shoe size is to be fitted in local shop.